Is it a crime to ... ? People look up stuff on google for different reasons. Teh intertubes keep a list of what people are looking up. I googled the phrase 'is it a crime to ...' and then worked my way through the alphabet. - Is it a crime to attempt a crime? - Is it a crime to bounce a check? - Is it a crime to cheat on your wife? - Is it a crime to contact al qaeda? - Is it a crime to drive without insurance? - Is it a crime to eavesdrop? - Is it a crime to fake your own death? - Is it a crime to flip off a cop? - Is it a crime to get angry online? - Is it a crime to hack someones facebook? - Is it a crime to impersonate a police officer/priest/someone/navy seal? - Is it a crime to kill [fill in any noun in the english language]? - Is it a crime to lie to [fill in a person]? Is it a crime to marry an illegal immigrant? 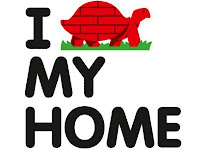 - Is it a crime to not pay taxes/file taxes/file a tax return? - Is it a crime to open [fill in anything mailbox related]? - Is it a crime to plan a crime/pay for crime? - Is it a crime to run over a dog/from the police/away? - Is it a crime to spit on someone? - Is it a crime to threaten [fill in random word]? - Is it a crime to urinate in public? - Is it a crime to use a fake diploma? - Is it a crime to view someones bank accounts? 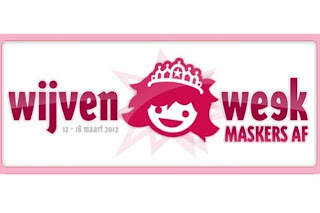 - Is it a crime to wear a mask? - Is it a crime to yell at someone? 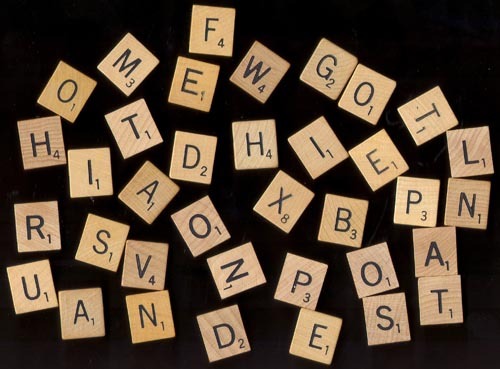 J, Q, X and Z are not in there, no one has yet thought of anything crime-related beginning with J, Q, X or Z.
Funnily enough, those happen to be the letters in Scrabble which are 8 and 10 points! Is high-tech modern architecture dangerous? An interesting piece in the New York Post on Saturday. 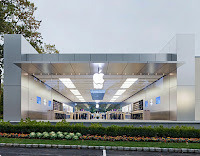 An octogenarian smashed into an Apple store window. Several interesting but very different ideas expressed in this little quote. 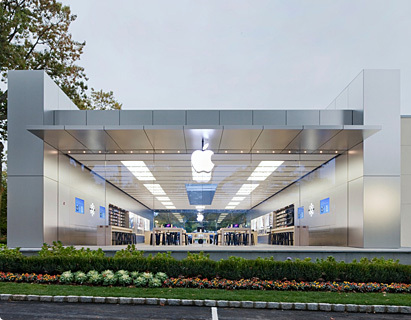 "Evelyn Paswall, a former Manhattan fur-company vice president, claims the tech company’s signature glass architecture is a menace to little old ladies after she failed to see the glass door at a Long Island location and smashed her face." I'm sure Bruno Taut is turning in his grave. Glass Architecture a menace to little old ladies. Paswall. Oh, the irony. Dr Livingstone and myself have been pretty selfish. On Monday we closed the shop early (by half an hour -gosh!-) and went to a building exhibition. We've been meaning to insulate the house as much as we can to cut back on our heating bills (heating oil is expensive!). We're nearly at the 1€ mark for one litre! We've already signed a contract to have the old double glazing replaced by something far more expensive efficient. And we've had some pretty strong ideas on what we would like on top of the roof and the outer walls, but were kind of stuck on what to go for and were not able to pick up the right information without spending loads of time on teh intertubez. So we used our freebie tickets and made our way from one slimy salesman to another (I spotted at least one with a toupet). One of them even (not sporting any hair) recognized me from way-back-when he used to run a newspaper store in a small village I used to live once upon a time. I've been searching my memory and I can't even remember where the shop was. Anyway, in the end we came away with a pile of information brochures, some telephone numbers and appointments with people coming to look over the house for: signs of water infiltration, combatting damp patches on walls and measuring for new wall insulation. We were very elated once we got back and hope we will end up with a nice clean salute to the Modernist Movement once all this is over and done with. First we need to pick the winning lottery numbers and then we'll be fine! Way back in the 1930's cooperations were testing the water and seeking out new fishing grounds to flog their products. Johnson's Wax Company advertised in Roman Catholic Magazines. 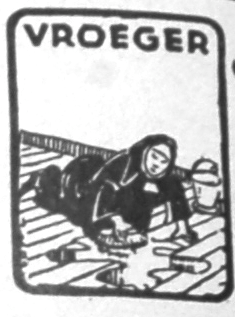 A Dutch 1933 ad shows a nun slaving over a wooden floor, scrubbing and polishing away. 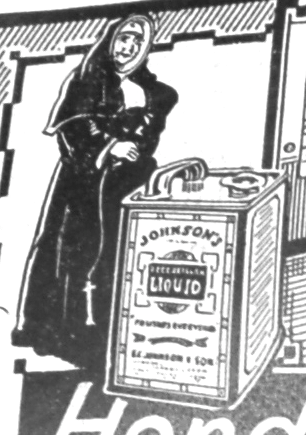 On the opposite side we see a nun standing next to a Johnson fluid wax can looking quite pleased. Looks like Johnson Wax is just in the nick of time to save the dear sister from some nervous break-down or a few kids from some corporal punishment involving a ruler of some kind. At the time of the ad SC Johnson & Son had 4 factories employing some 50.000 workers. The main Dutch office was located in THe Hague. Today, we commemorate the 40th anniversary of the death of modern architecture! According to Charles Jenks, it died around 3 p.m. on March 16, 1972. 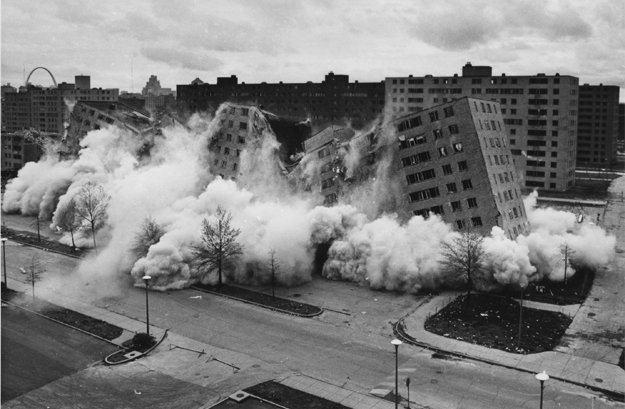 The urban housing of Pruitt Igoe in Saint-Louis an appartmentblock (designed by Minoru Yamasaki & George Hellmuth) was demolished, 16 years after it was built. Today it is mostly referred to as the icon of failed public housing. A recent documentary tries to reconstruct the context of the demolition, which is very layered and complicated. A butler to cater for all my needs, a state of the art new bathroom, a garden to relax in with all the work done and the winning number combination for Saturday's lottery. I want grey, Dr Livingstone does not. Listening to songs from the eighties in my iTunes library, and then singing along to them at an annoyingly loud volume. Modernity really kicked in during the 1930's in churches and hospitals/old folks homes run by brothers and sisters of various religious orders. In Amsterdam, in the Gesticht van Liefde St Bernardus, a moving pulpit was used and rolled to the middle of the chapel to facilitate the (plentiful) elderly who were hard of hearing. 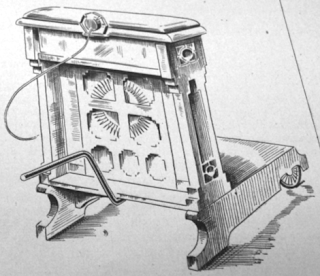 It was made of wood on a pedestal, placed on two rubber wheels and two supports at the front. At the sides there was an iron rod to prevent the thing from flipping over during the sermon and to easily move it about. It measured 0,80 x 1,05 meters and was 1,4 meters tall. A microphone could be secured at the front so speakers could be used in the back of the chapel, or in other parts of the hospital so those who could not get out of bed could hear the service. Here's another crazy moving pulpit contrapion in Carlisle (UK). Today, a new book was delivered by the postman, who, very annoyingly, drove his moped all the way up to our front door! It's More Lives Than One(1938) by Claude Bragdon, best known for being the architect who designed the New York Central Station, Rochester, N.Y. (alas, demolished). I came across Mr Bragdon while doing research for my paper on electrical lighting in churches and he seems to have dabbled in church and lighting design. Bragdon is a very interesting, but strange character. He was a theosophist, following the writings of Madame Blavatsky. On a different note, there is a very interesting book I recommend, alas it has not to my knowledge been translated yet. 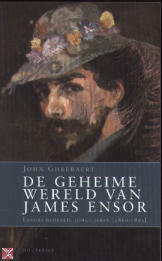 It is De geheime wereld van James Ensor [The Secret World of James Ensor] by John Gheeraert. I think it should be translated because it recounts a very interesting period in Ensor's life while Blavatsky was in Ostend writing her Secret Docrine (published in 1888) and, according to Gheeraert, he was fascinated with her and her ideas. The author Gheeraart says: 'The key to Ensor's secret lies in his Brussels period. There he got into contact with the famous freethinker Ernest Rousseaux. I further discovered that the co-founder of the Theosophical Society, Helena Blavatsky, between 1886 and 1887 a year in Ostend and lived there her "secret doctrine" wrote the bible of the theosophists. My research showed that Ensor, in his most creative period, much of the esoteric works were derived from Blavatsky. But Ensor was also friends with famous Asia-traveler, Alexandra David-Neel. 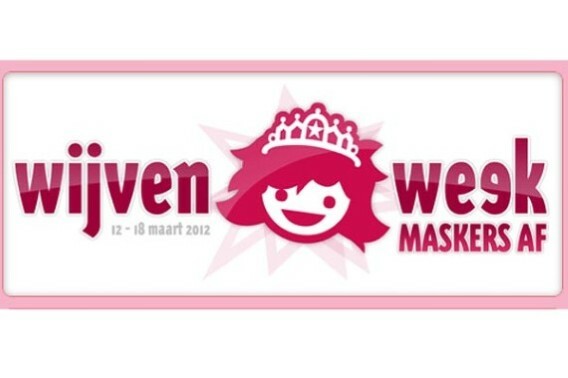 She also spent some time in Ostend. I discovered such totally unexpected sources that provided insights about a painter whose life is usually seen as 'boring'. " The book does teeter on the edge of fiction as it is not a full-blown biography, but still some interesting stuff. Churches crammed with religious folk are a thing of the past in Western-Europe today, but not so in the 1930's. A lot of people in a closed locale wasn't too pleasant before aftershave and deodorant were prolific among the masses. So mediating smelly arm-pits and pongy feet in summer through the use of ventilation became a hot topic. Ventilation in silent-running mode of course. 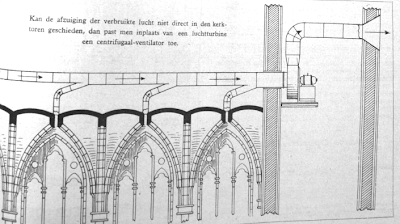 Acoustics was/is a big issue in church buildings and extra noises were/are to be avoided. Numerous are the articles on how d.i.y.-priests could tackle noisy pipes in their own House of God. 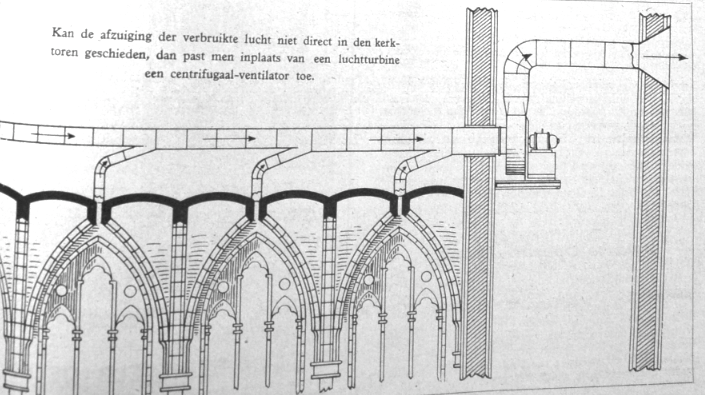 A cross-section drawing of a ventilation-installation show a possible set-up for expelling the foul air. There is a preference expressed that it be vacated through the bell tower if at all possible. However there is not a mention on how fresh air is to be pumped into the church. My guess is the priest would be hunting down whistling doors from drafts in the building instead of poltergeist-like banging sounds in his plumbing system. 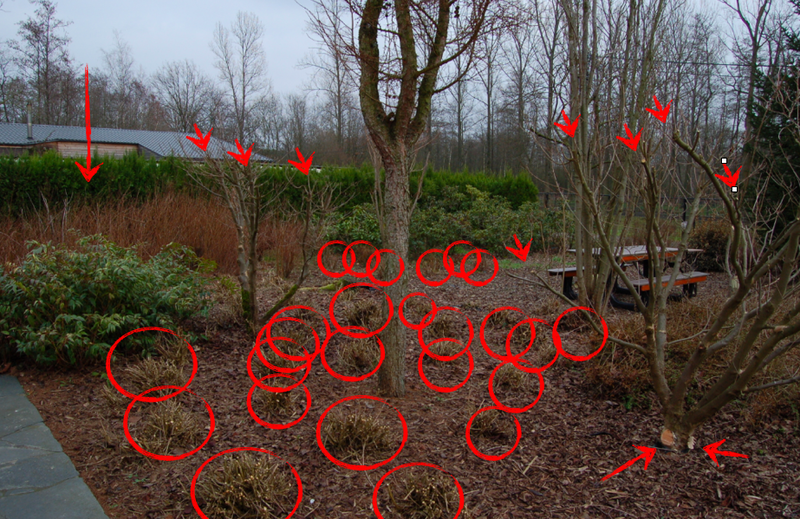 I'm in pruning mode right now. I'm freeing up time I should be spending on writing a dissertation to prune some stuff in the front yard so it can bloom and blossom. Spring is in the air, the trees are carrying buds, my hazel tree has there little pinkish furry bits sticking out. I need to cut everything away before the saps start streaming through the twigs again. I've done a considerable bit already. I hope nothing gets damaged in the proces. I'm an intuïtive gardner. Which means I don't have a clue when and how much I should be pruning, but if it doesn't look neat it has to go! Hmmm. This is coming from a man who wants to grow vegetables and fruit. Luckily we do not own a chainsaw! Insects are alive and kicking. A lot of bumble bees flying about. And loads of ladybirds. The native species kind. Birds are making an awful ruchas. And when Dr Livingstone came home on Thursday, he ran over a frog in the carport. He noticed it too late to avoid. Poor bugger. Having gone through all the trouble of surviving a strange winter, Kermit ends up under the wheel of a Mini. What a way to go. We've called in someone with a tractor to break the soil so the water can drain away faster. We had to mark out the sewage pipe first so it didn't get turned up by the machine. The guy had been here before to do the top layer of soil, but now it was time to dig a little deeper. The ground was surprisingly dry enough not to get bogged down or stuck. We hope this will help to keep humidity away from the house. He'll be back in a couple of weeks to make it all nice and level. I'm puzzled at the postman. Apparently he was at the front door, I was home, but he never knocked and just left the parcel in the carport. He was bringing a book I ordered, which is additional reading for the Art & Design class I'm taking this semester. 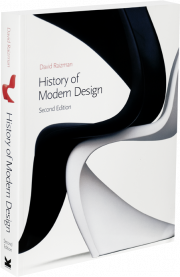 It's the second edition of History of Modern Design by David Raizman. I'm still expecting another book, up until yesterday. I had ordered it on the 17th of February and it still hadn't arrived. I phoned up the book store, I looked at the shipping status and it said 'unknown address, parcel has been returned'. So much for the stupid parcel courier who failed to use his brains and turned into Mr Lazybones. I just asked the kind lady from the customer service to ship it to their nearest book branch, I'd rather pick the book up myself. That would save me: a) time b) a lot of frustration. My guess is they would have re-shipped it again and the same dipstick would have failed to find the house for a second time. 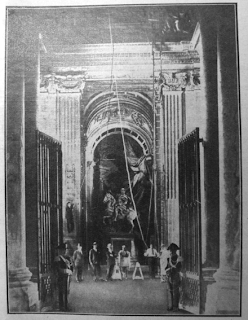 Another gem of a picture concerning the installation of telephone wires in the Belvedere in Vatican City in 1930. My guess is this is at the Cortile or the beginning of the Galleria delle Statue. I think those iron gates are still there but I could be very wrong. I didn't find any pictures of the mounted figure on horse back behind the men posing for the picture, and there are stairs where (I think) the statue could have been. 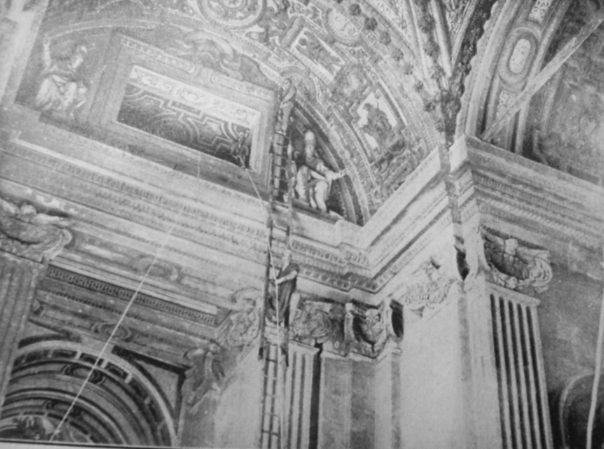 According to the Vatican Telephone Service the first central telephone exchange, donated by the American Catholics in 1930, was installed in the Belvedere building and provided telephone services for approximately 360 end users; it remained in use until 1960 when it was replaced by a Pentaconta exchange with a capacity of 1,500 numbers later extended to 3,000. My source specificies there was approximately 80.000 meters of cable involved, connecting 400 telephone sets, but expandable up to 800. The telephone exchange was consecrated by the Pope on the 19th November 1930. The Bell Telephone Rotary-system was state of the art at the time. 5) priority for some telephone sets for emergencies and important calls. 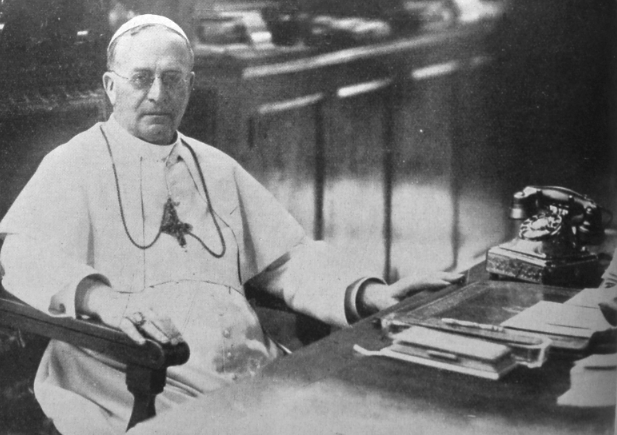 Here's Pope Pius XI sitting next to his gold-inlayed Bell telephone. A leading Israeli Rabbi had a meeting with the Pope. While negotiating a papal visit to The Holy Land, the Rabbi noticed a distinctive red phone on the Pope’s desk. The Rabbi asked what the phone was for. The Pope explained that it’s a direct line to God. The Rabbi asked if he could test it, and the pope replied, “Of course, but you should leave one-hundred dollars for the call.” The Rabbi thanked him and used the phone. A few months later, the Pope was visiting Israel as they had planned, and he made sure to make a stop to visit his new Rabbi friend. While talking, the Pope noticed a red phone on the Rabbi’s desk. The Pope asked if he could test the phone, and the Rabbi said that he could but that he needed to leave fifty cents for the call.